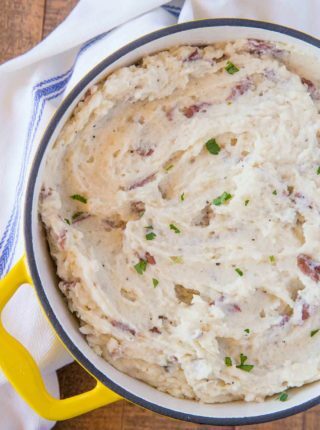 Our dinner table wouldn’t be the same without all of the work we put into perfecting our side dish recipes, and this week we’re loving Creamy Garlic Mashed Potatoes, Baked Mac and Cheese, and Green Bean Casserole. 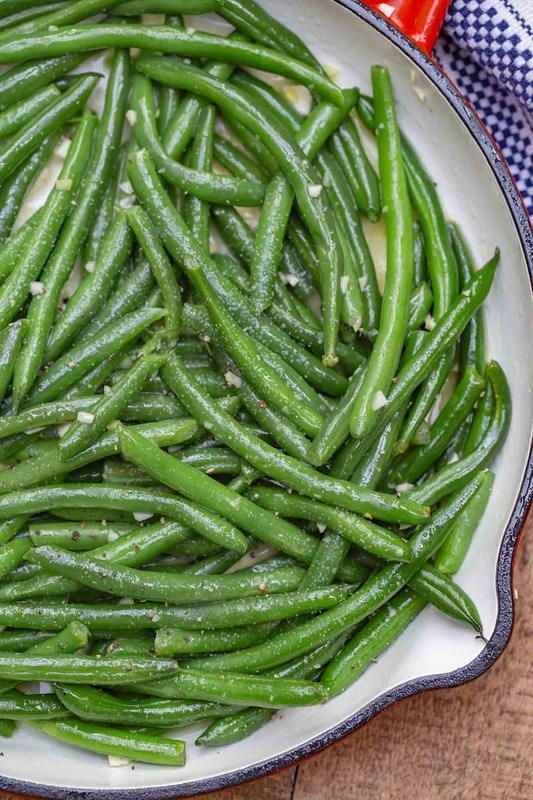 Sautéed Green Beans are hot and buttery, with savory garlic flavor and a fresh crisp-tender texture. I usually make a double batch of these beans because they always manage to disappear before dinner is over. You can use butter or olive oil to sauté them, both add a nice flavor with the garlic. A close second to this recipe is my Roasted Green Beans, and Spicy Chinese Sichuan Green Beans. String beans are very versatile, so you can add a lot of different flavors to them! 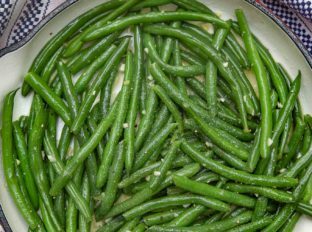 CAN I MAKE GARLIC GREEN BEANS WITH VEGETABLE OIL? You can use any oil you have in your kitchen for garlic green beans, including vegetable oil, coconut oil, or olive oil. Personally, I like to go with butter because my family likes the flavor, and it has the highest cooking temperature of all of them. 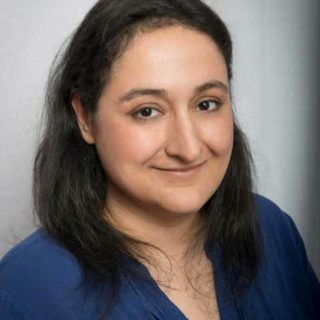 A restaurant trick is to mix butter and extra virgin olive oil together to get the flavor of the oil with the cooking temperature of the butter, making it easier to sauté your garlic before adding the beans without burning. CAN I SAUTé GREEN BEANS WITHOUT BLANCHING? Technically you can get away with not blanching the green beans before throwing them in the sauté pan. 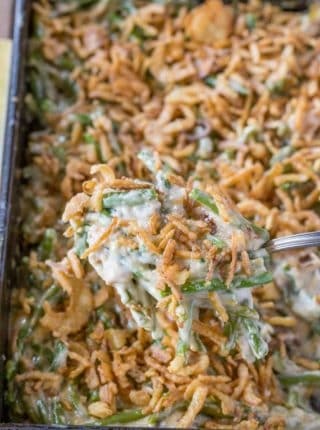 But I always like to blanch them first because it helps preserve the texture and bright green color of the fresh green beans, making for a better overall side dish. CAN I BLANCH GREEN BEANS AHEAD OF TIME? You can blanch green beans ahead of time. Dip them in ice water right after blanching (to stop the cooking), then dry them as well as you can with paper towels, and store them refrigerated in an air tight container until you’re ready to sauté. 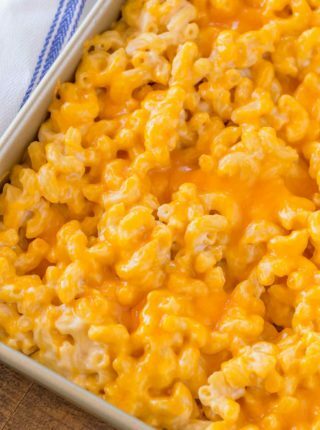 They’ll last in the refrigerator for a total time of 1-2 days before they start to get too soft to be sautéed. CAN YOU TRIM GREEN BEANS IN ADVANCE? You can trim green beans in advance if you are going to use them within 1-2 days. Keep the green beans refrigerated and tightly sealed. Pull them out when you’re ready to make any green beans recipe. Add other spices to the beans with the garlic for more flavor like oregano, cayenne, or thyme. 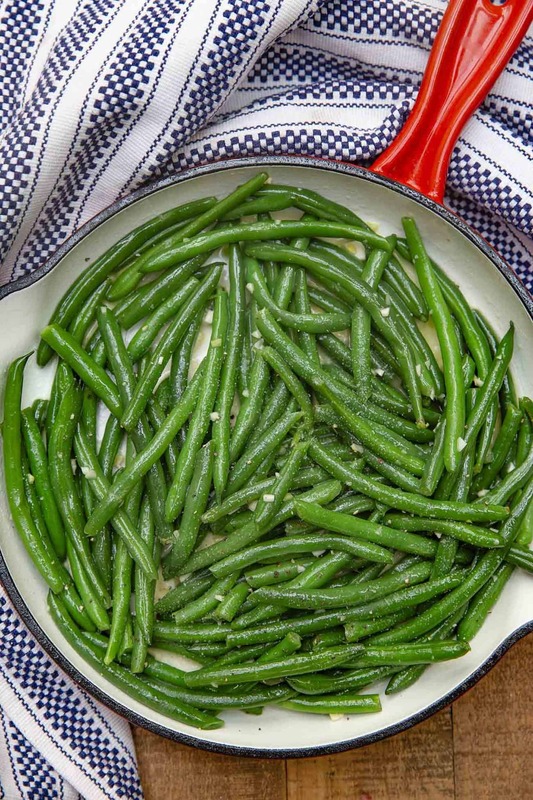 Garlic green beans also work well with sautéed onions, mushrooms, sliced toasted almonds, white wine, lemon juice, or a tablespoon of parmesan cheese. Trim the ends of your string beans to avoid a fibrous woody texture. Sauté the beans in a skillet over medium-high heat for 3-5 minutes max, so they don’t overcook. You want to maintain that tender-crisp texture in your beans recipes. If you don’t have fresh garlic, sub in 1 teaspoon of garlic powder instead. If you use frozen green beans for this dish, you can skip the blanching step and go straight to the sauté pan. If you’re cooking for someone with allergies, this dish is naturally gluten free! Sauteed Green Beans made with butter, garlic, and fresh green beans is the PERFECT side dish that goes with almost any meal and is ready in under 15 minutes! In a large skillet add 1/4 cup water and the green beans on high heat and bring to a boil, cooking for 3 minutes. Remove green beans and water, wiping dry with paper towels and add in the butter and garlic, stirring and cooking until fragrant before adding in the green beans, salt and pepper and tossing to combine. I’m really looking forward to making this recipe, I’ll add some oregano to them. 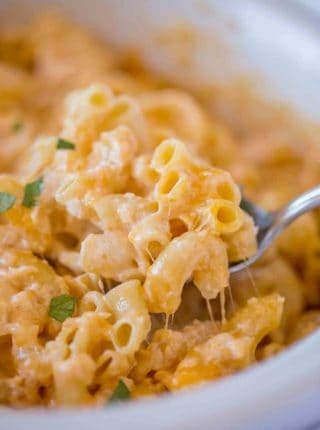 I make these all the time and they are delicious! So glad you enjoy them, Allyson! Green beans are one of my favorite veggies. This recipe looks very tasty! It’s so good!! I hope you enjoy it! Green beans have never been my favorite, but cooking them this way, makes them so much better!! They have become a favorite! Yay!!! Glad to have converted you, haha! I love a simple, easy, delicious side dish like this one! Me too, no need to get complicated! Such a lovely and delicious simple green bean recipe!